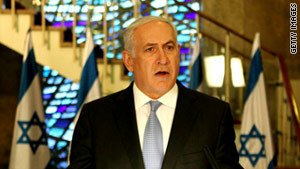 Israeli Prime Minister Benjamin Netanyahu is scheduled to address AIPAC on Monday. Washington (CNN) -- Israeli Prime Minister Benjamin Netanyahu gets his chance Monday night to address the main U.S. Jewish lobby when he speaks to the American Israel Public Affairs Committee in the wake of U.S. President Barack Obama's remarks to the group the day before. Obama on Sunday sought to tamp down any controversy over his remarks last week that Israeli-Palestinian negotiations should start from pre-1967 borders and include land swaps. The proposal, a longstanding formulation in peace talks that Obama for the first time expressed as official U.S. policy, was immediately rejected by Netanyahu as unrealistic and prompted criticism from political opponents back home. Now Netanyahu will have the final word on the issue, at least for now. He sounded more conciliatory toward Obama after the U.S. president sought to reassure the vital U.S. Jewish lobby on Sunday of his administration's commitment to Israel's security while also making clear his desire to kick-start the stalled Israeli-Palestinian peace talks at a time when the entire Middle East landscape is changing amid the so-called Arab Spring demonstrations. In the speech Sunday, Obama acknowledged that he expected some controversy from his call Thursday for negotiations to be based on border demarcations predating the six-day war of 1967, in which Israel seized the West Bank, Gaza Strip and other territory. However, he said, his policy on the border issue "means that the parties themselves -- Israelis and Palestinians -- will negotiate a border that is different than the one that existed on June 4, 1967," the eve of the war. Those negotiations will involve "mutually agreed-upon" land swaps to deal with changing conditions of recent decades, he said. "That's what mutually agreed-upon swaps means. It is a well-known formula to all who have worked on this issue for a generation," Obama said to applause. "It allows the parties themselves to account for the changes that have taken place over the last 44 years," including the new demographic realities on the ground and the needs of both sides. His proposal contained "nothing particularly original," he said, adding that "this basic framework for negotiations has long been the basis for discussions among the parties, including previous U.S. administrations." "If there is a controversy, then it's not based in substance," Obama said. A statement by Netanyahu responding to Obama's AIPAC speech steered clear of specifics, saying: "I share the president's will to promote peace and I value his current and past efforts to achieve this goal." "I am determined to act together with President Obama in order to find ways to resume the negotiations for peace," said Netanyahu's statement Sunday. "Peace is a vital need for all of us." AIPAC is an important political ally in the United States. Leaders from both parties, including Senate Majority Leader Harry Reid, D-Nevada, and House Speaker John Boehner, R-Ohio, also are scheduled speakers Monday night. In his speech Sunday, Obama repeated a line from the Thursday address that the "status quo" in the Israel-Palestinian conflict is unsustainable. He listed a series of reasons why conditions on the ground dictated the need for a revitalized peace effort now. "First, the number of Palestinians living west of the Jordan River is growing rapidly and fundamentally reshaping the demographic realities of both Israel and the Palestinian territories," Obama said. "This will make it harder and harder -- without a peace deal -- to maintain Israel as both a Jewish state and a democratic state." He also cited the increasing difficulty for Israel to defend itself against regional enemies, and the "new generation" of Arabs reshaping the entire region through the protest movement that already has toppled governments in Tunisia and Egypt. "A just and lasting peace can no longer be forged with one or two Arab leaders. Going forward, millions of Arab citizens have to see that peace is possible for that peace to be sustained," Obama said, adding that a growing regional and international impatience with the Israeli-Palestinian peace process is leading some to look for other options, such as a U.N. resolution in September to recognize an independent Palestinian state. Even though such a U.N. General Assembly resolution would be nonbinding, Obama told the AIPAC meeting that the United States would oppose any effort to isolate Israel in international forums. He also repeated U.S. criticism of Hamas, the Palestinian group that governs the Gaza Strip and is considered a terrorist organization by Washington. Hamas and the other main Palestinian group, the Fatah party of Mahmoud Abbas that heads the governing authority in the West Bank, agreed on May 4 to work together to set up unifying elections in May 2012. Maen Areikat, the chief Palestinian representative to the United States, told CNN on Sunday that Fatah would continue to negotiate on behalf of the Palestinians until they can elect their own leaders and representatives next year. "Hopefully, come May 2012, the Palestinian people will be able to choose those people who are committed to negotiating a peaceful resolution with Israel," Areikat said, conceding that Hamas would be a voice in any Palestinian unity government that emerges from next year's vote. Obama said Israel cannot be expected to negotiate with Hamas until it renounces violence and recognizes Israel's right to exist as a Jewish state. The audience applauded loudly when Obama also called for Hamas to release Gilad Shalit, an Israeli soldier captured five years ago. In response, Hamas spokesman Sami Abu Zuhri told CNN that the U.S. government has "a clear preference for Israel" at the expense of freedom for the Palestinian people and their right to establish a sovereign state.